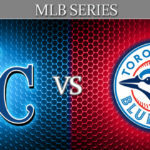 This game will start a three game series between the Toronto Blue Jays and the Kansas City Royals, which is going to be played at the Kauffman Stadium. The Royals are coming from a three game series against the Boston Red Sox, which they started by losing the first game, ending it 4 – 2, but in the second game, the Red Sox were able to bounce back and get a win to tie the series. The third game of the series ended 6 – 4 for the Royals, ending the series two games to one. At the time of writing, the Blue Jays have not finished their four game series against the Texas Rangers, so we will be looking at their stats with that game missing. The first game of the series was a 7 – 6 win for the Blue Jays, but in the second game the Rangers were able to tie it with a 6 – 1 win. In the third game, the Blue Jays walked away with a win. These two teams have had similar season, hanging closer to the bottom of the table than to the top. The Blue Jays have had good results all season long, but it just has not been enough to jump to the top of the table in one of the toughest divisions of the MLB. They have won thirty five and lost thirty six of their seventy one games this year, for a .493 winning percentage that has them as the fourth placed team in the eastern division of the American League, five games behind the Yankees and tied with the Orioles. They visit the Royals at the Kauffman Stadium, with what has been one of the worse parts of their season, a .457 winning percentage from having won sixteen and lost nineteen of the thirty five games played away from their home fans. The Royals have won thirty five and lost thirty six of their seventy one games in 2017, for a winning percentage of .493 that has them in the third place of the central division of the American League, three and a half games behind the Cleveland Indians in first place and a game and a game behind the Minnesota Twins in second place. They receive the Blue Jays at the Kauffman Stadium, with a home record that is average at most, having won nineteen and lost seventeen of the thrity six games they have played at home, for a .527 winning percentage when playing in front of their home fans. Both teams are coming into this game from wins, but the main difference being their form in the last ten games. The Blue Jays have done well, winning six of their last ten games, but the Royals have done better, winning eight of their last ten games, losing only two. Jake Junis will be starting for the Royals in this game, and he will be making only his fifth start of the season and his career. The twenty four year old has won two starts, lost one and left the other one undecided, where he played 22.2 innings, allowing 28 hits, 17 runs and 6 home runs, also being able to strike out 19 players for an earned run average of 5.56. This will be his first start against the Blue Jays. J. A. Happ will be the starter for the Blue Jays in this game, which will be his eighth start of the season. In his previous games, he has not done so well, winning only two and losing four, leaving one game undecided. He has pitched 38 innings, allowing 39 hits, 18 runs and 8 home runs, while also striking out 44 players and accumulating an ERA of 4.26.